Currently, chronic kidney disease is killing thousands in poor farming regions like Sri Lanka. But this isn’t any ordinary kidney disease, as sufferers are developing the deadly condition without any ordinary risk factors. A recent study indicates researchers may have pinpointed the cause of the epidemic, and it’s found in Monsanto’s Roundup pesticide. The Center for Public Integrity says fatal chronic kidney disease of unknown origin, or CKDu, has killed more people in El Salvador and Nicaragua than AIDS, diabetes, and leukemia combined over the past five years. This wave of CKDu affecting numerous poor farming countries around the world simply didn’t exist prior to 1990. 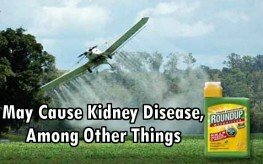 In the new study, recently published in the International Journal of Environmental Research and Public Health, scientists sought to isolate the potential cause of the kidney disease that is ripping through these countries and wiping out otherwise healthy adults. Sri Lanka underwent major political changes in 1977 that led to changes in agriculture, ultimately resulting in new chemicals like pesticides and herbicides being imported for the production of rice. It is one of these chemicals that the researchers thought may be connected to the sudden emergence of CKDu in 1990. They labeled the possible culprit Compound X and suggested whatever was causing the disease had to have certain characteristics. When looking at a map of the CKDu epidemic, scientists could see a direct correlation with the disease and hard water prevalence. The “harder” the water in a region and the more heavy metals present, the higher the rate of CKDu. From this, they determined Compound X must form stable complexes with hard water, present difficulties in identification, and be able to capture, retain, and deliver metals like arsenic into the kidneys. They also surmised after studying the characteristics of the CKDu in patients, that Compound X must have multiple modes of exposure including ingestion, through the skin, and through the lungs. Glyphosate is the active ingredient in Monsanto’s poster-child RoundUp. And it’s glyphosate that becomes even more extremely toxic when it mixes with the heavy metals in hard water. Glyphosate, the researchers determined, is killing farm workers by the thousands. Kidney cancer is very common in Colorado. I lived there for 4 years, and was made fun of all the time by folks for driving 95 miles round trip to shop at an organic farm. And don’t forget — chemtrails. Even Al Gore thinks it is wrong. Google Al Gore and chemtrails. What next? We are now inundated with poisons, warnings, radiation plume coming in early May..on the WEST COAST…I’m just f-ing overwhelmed!! Where to go..what to do? ?…all of our denial is finally catching up with us….I just take one step at a time..and do what I can do….love to all…stay safe….